As you treat your selves with this piece, feel free to ask questions about it, tank modeling in general etc. 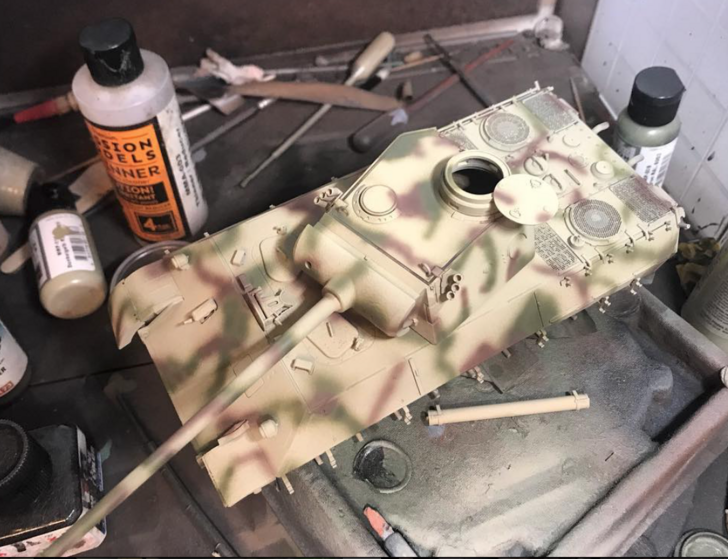 and JandersUF will answer these questions in next tank model post (Sunday)! 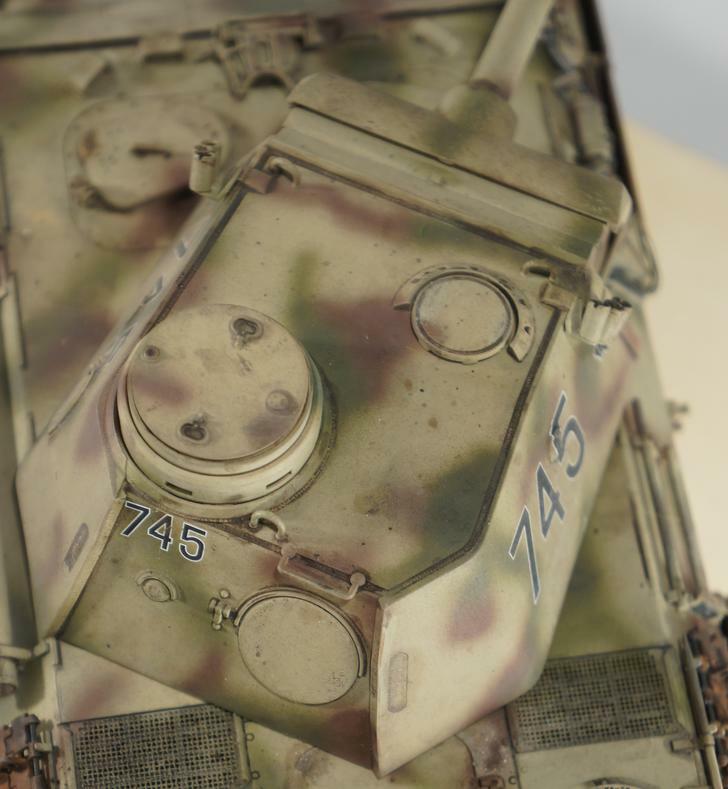 1/35 scale plastic model by Tamiya of a German Panther Ausf. 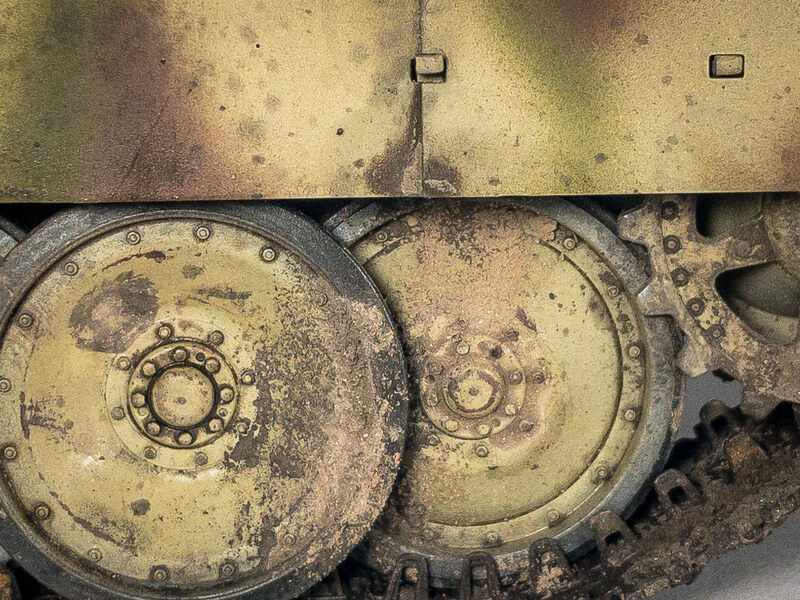 D, as seen at the Battle of Kursk 1943. This was the first operational deployment of the Panther, a powerful medium tank (other nations may have considered it a heavy). 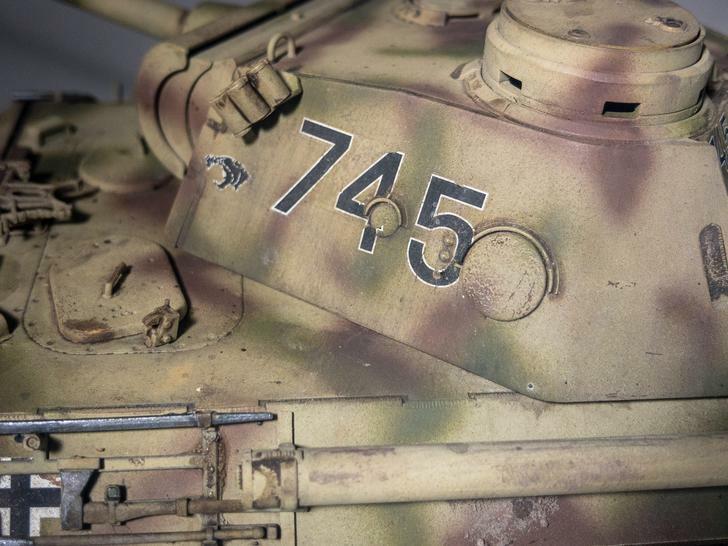 It had a long 75mm cannon which could deal with just about every Allied tank at range. 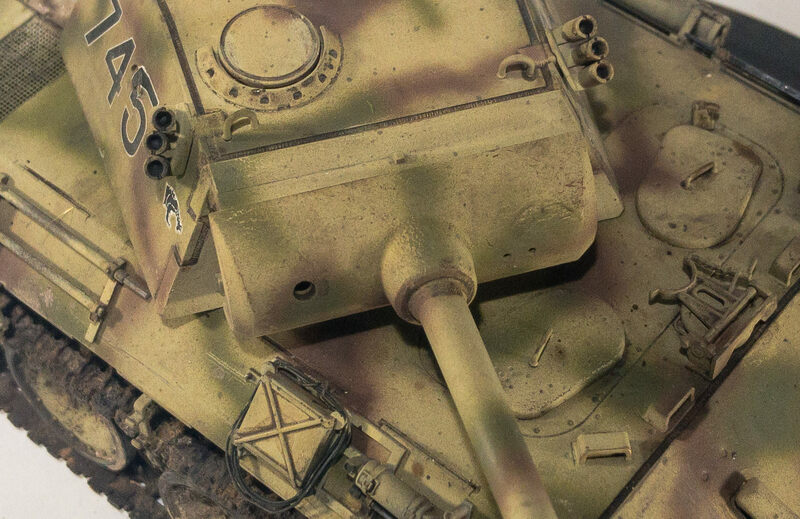 It had thick, sloped frontal armor. It had a complex suspension, which did give solid mobility. However it was plagued by significant teething problems at Kursk, with multitudes of tanks breaking down without even getting into combat. 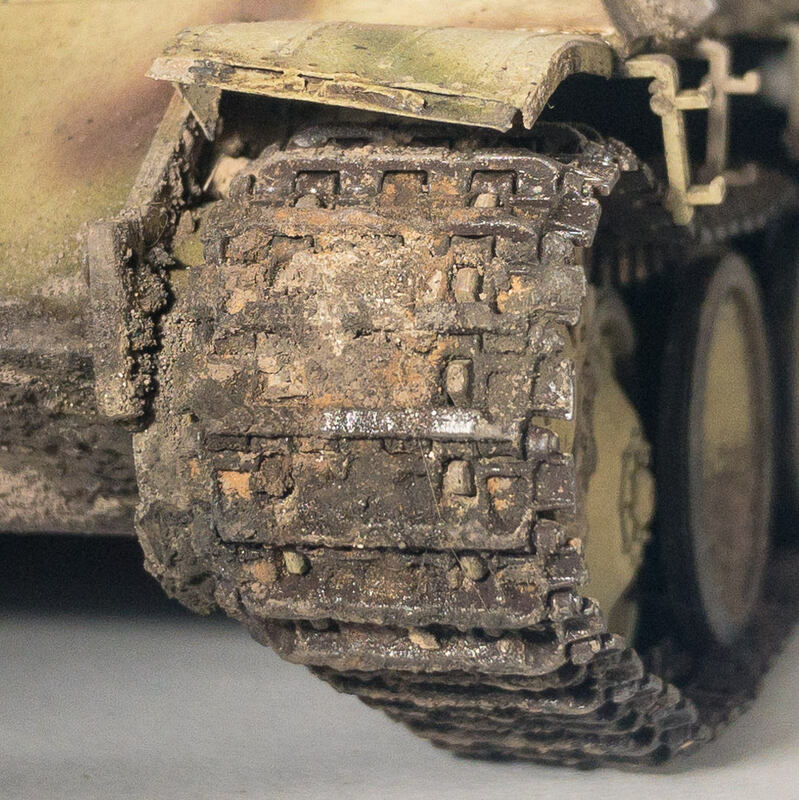 This was a quick build, using the base tamiya kit, after market PE mesh screens for the engine deck, the Tamiya brand individual track links, and an aftermarket brass muzzle and turned metal barrel. Painted using Stynylres Primer, Mission Models paints, then weathered with a plethora of oils, pigments by VMS, and Uschi metal powders. 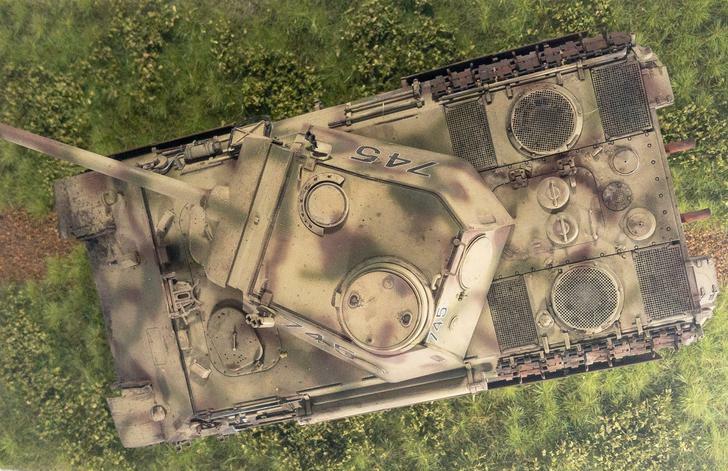 A real photo of the tank in question, Panzerkampfwagen V Sd Kfz 171 Ausf. 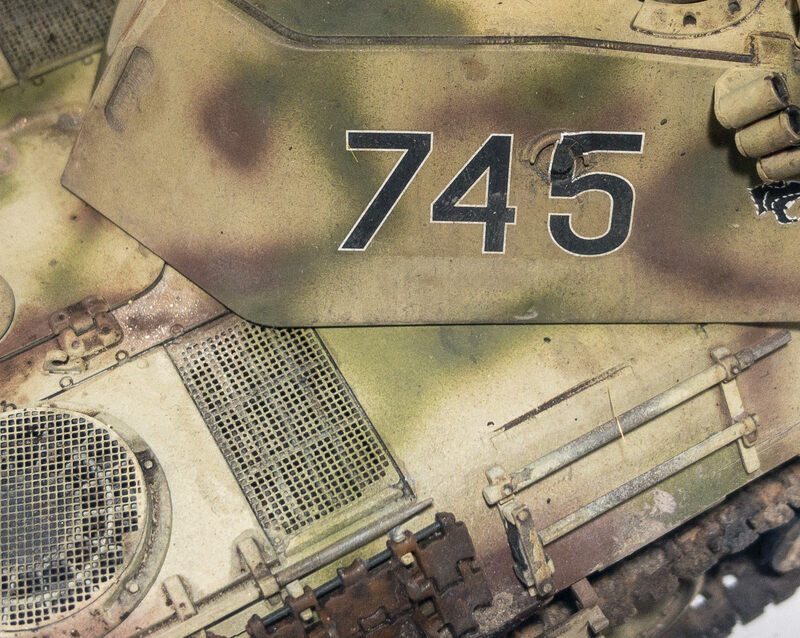 D #745, from the 7th Company 52nd Panzer Abeteilung 39th Panzer Regiment, Kursk, July 1943. 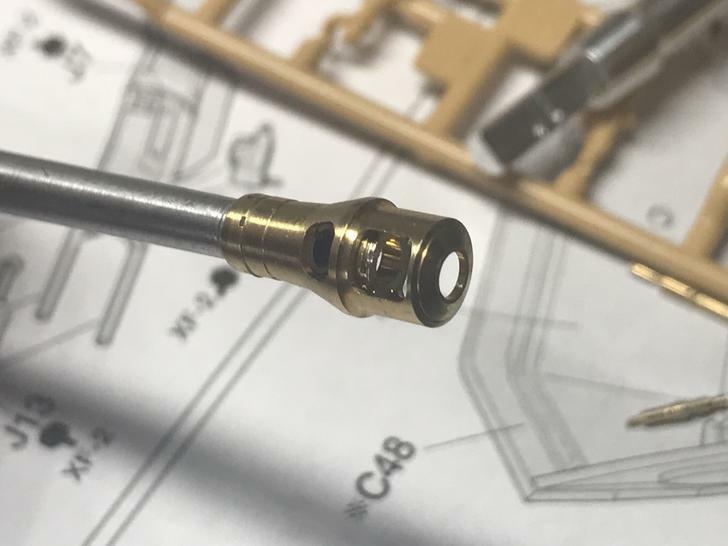 There are a number of mistakes I made during the construction of this kit. One is visible here; the metal storage boxes on each side of the rear are constructed inside-out. The “X” should bow OUTWARDS, not indent inwards as I made them. Whoops. I did drill out the exhaust pipes to give them a closer-to-scale thickness and depth. 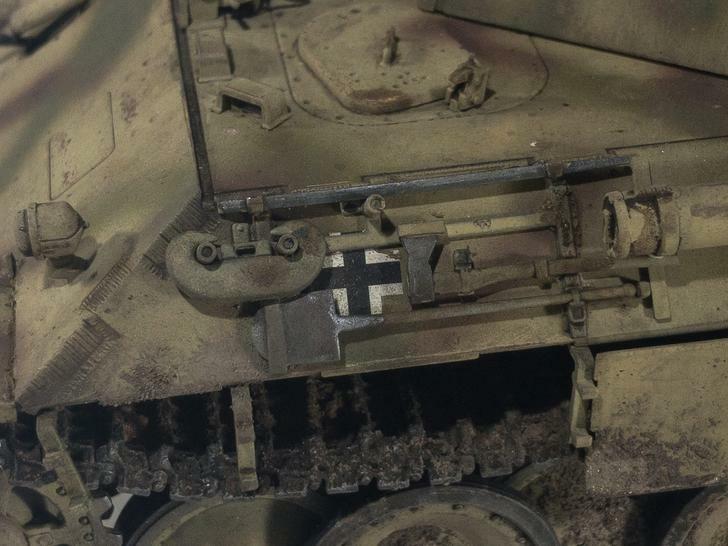 I AM happy with the overall “texture” of the paintwork of this model. 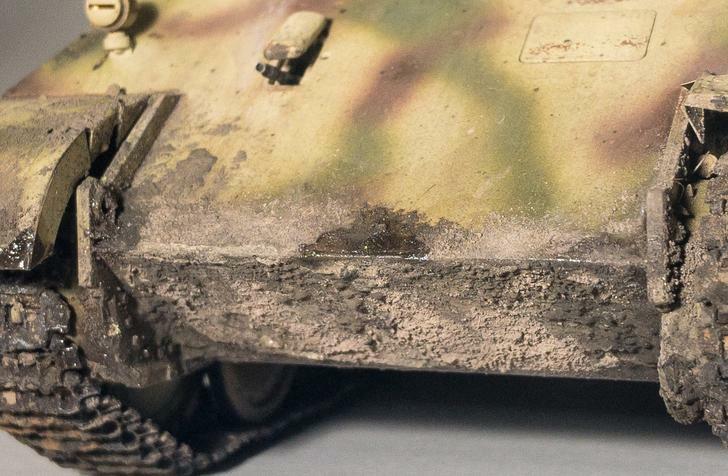 I did a lot of reasonable subtle chipping to show worn surfaces, exposed primer and the like. 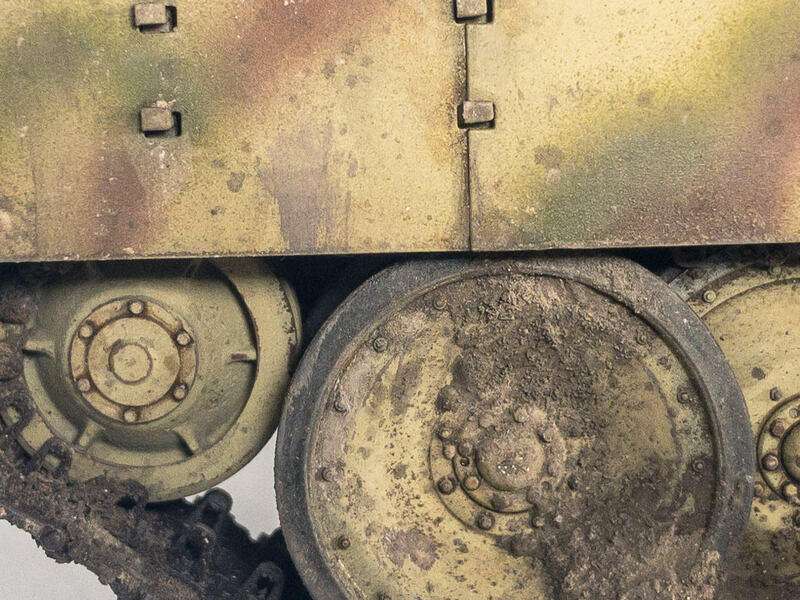 As well there are a lot of layers of oil rendering, streaking, stains, spots, and dust with fresh mud to give it that classic “lived in” look. 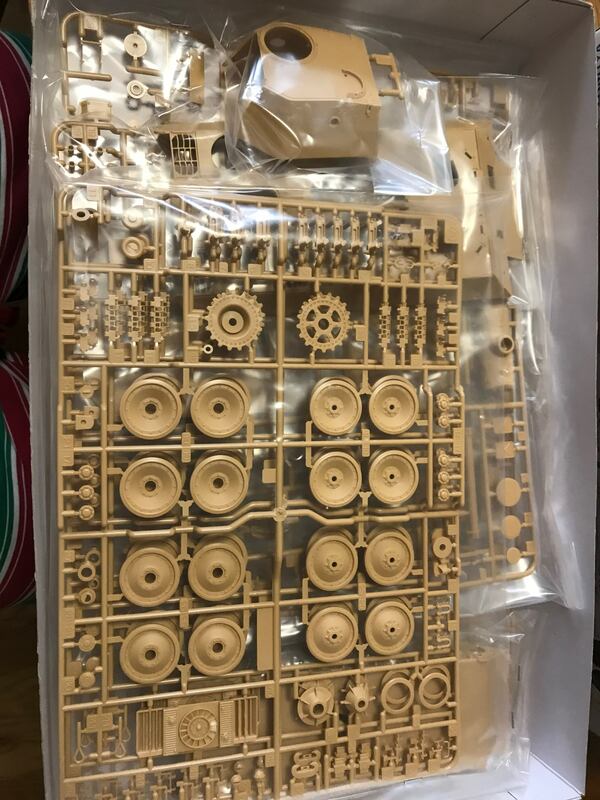 It all starts with a lovely box of sprues. Tamiya has the best plastic bags, I must say. True luxury. Frankly the included plastic barrel was good enough– the metal turned barrel is cool but not really necessary. 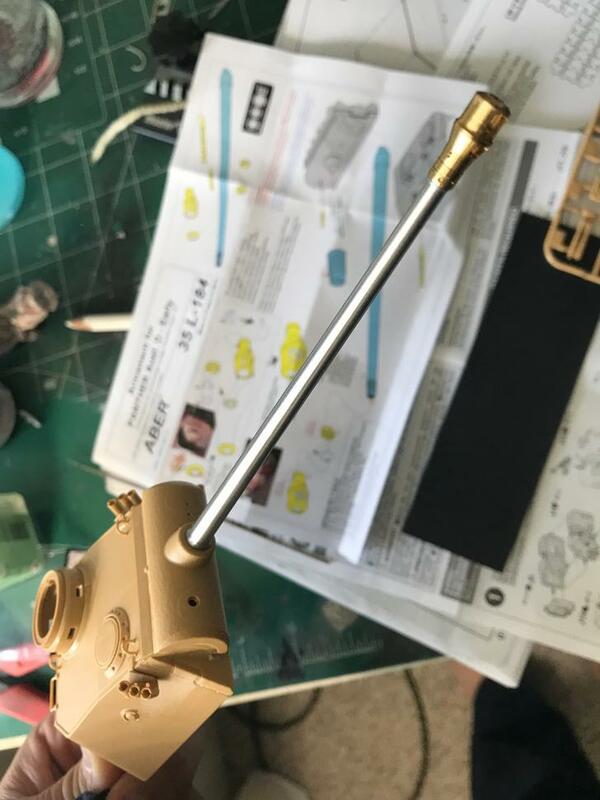 However this gorgeous brass muzzle brake is infinitely better and easier than the included kit plastic. I would suggest some form of individual track links (instead of the included “rubber band” vinyl tracks). 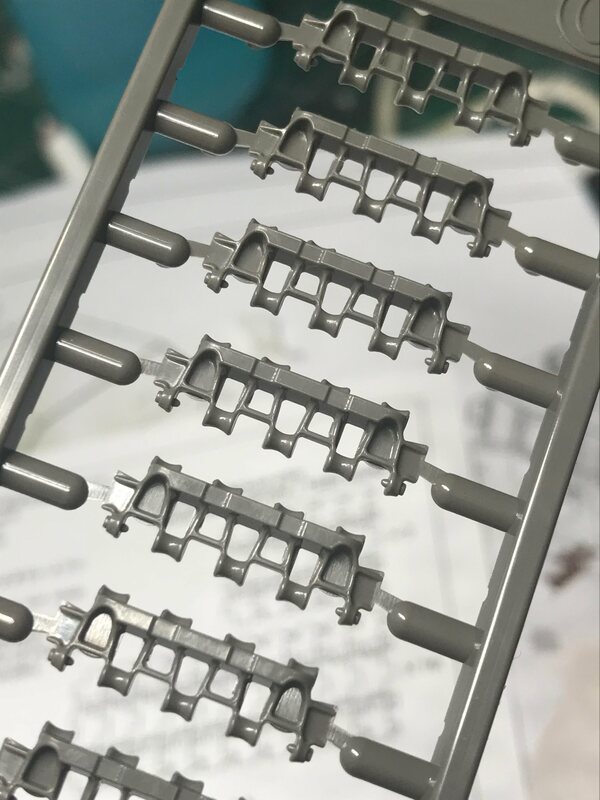 These are the Tamiya brand click-together links. The big difference is they have hollow guide horns. The included vinyl have incorrect solid guide horns. We’ll see examples later. This is the primer (Red by Stynylres, highly recommended). 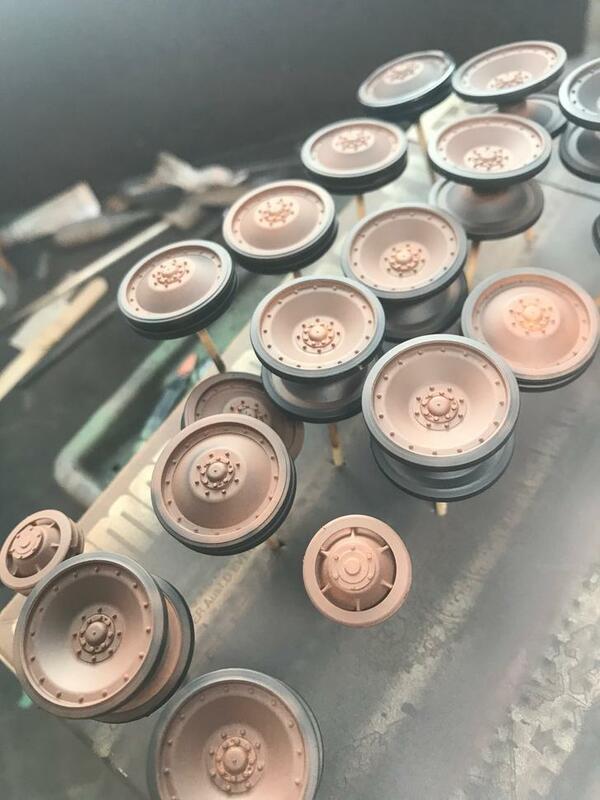 I free-handed the rubber “tires” with my airbrush. 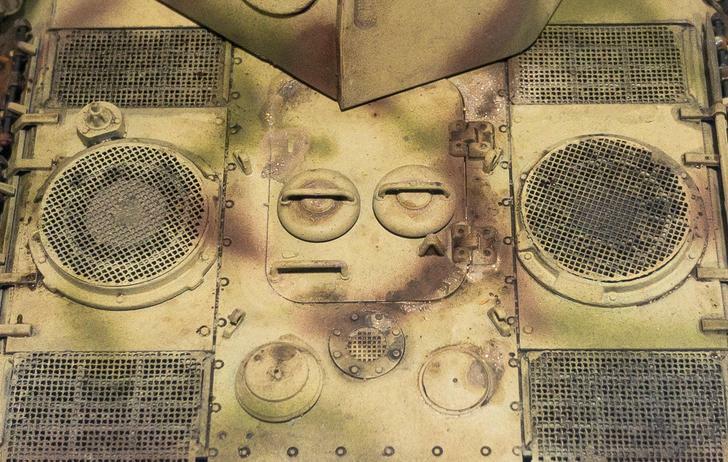 Then we sprayed a layer of hairspray, and the camo pattern using Mission Models. It was then chipped with a damp brush and various little tools. 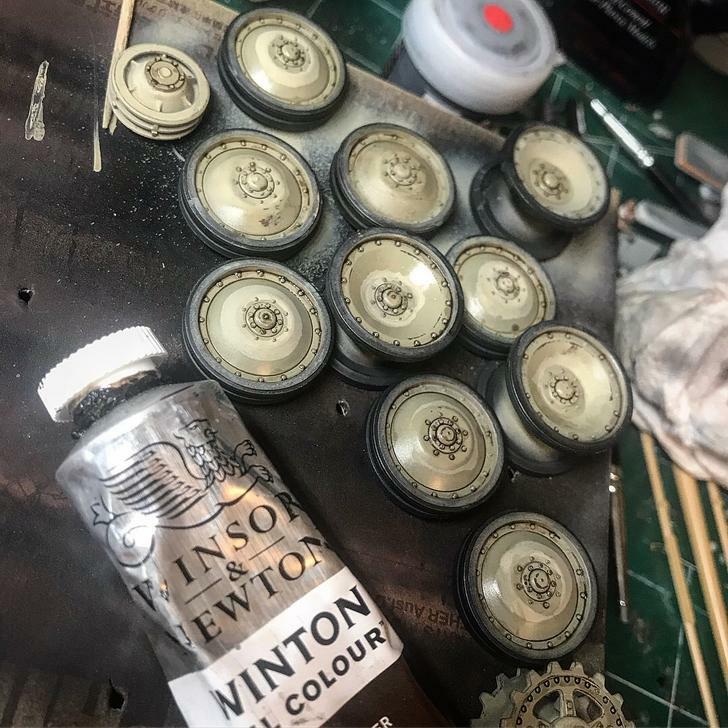 I did some good old fashioned pin washes to bring out the details. Then it was a lot of oil rendering and layers of splashes, streaks, and pigments. 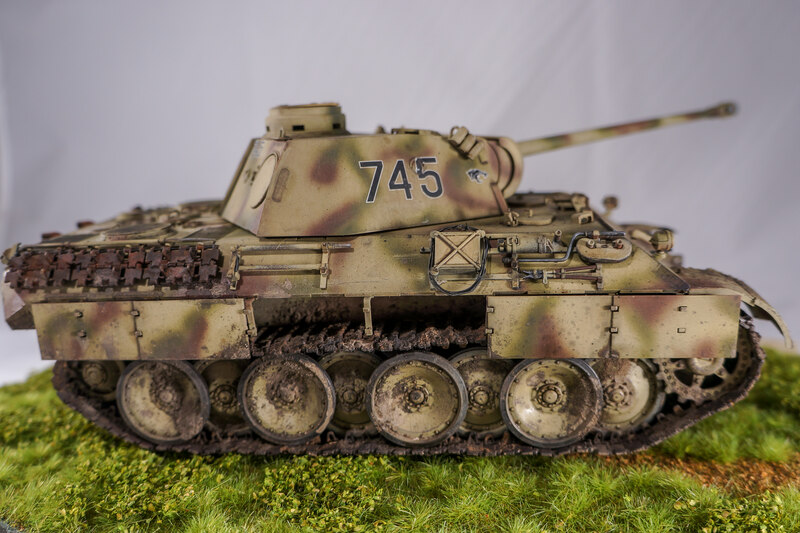 End result… I did knock off some of the protective skirts, as photos from Kursk show most of the Panthers lost them once engaged. They were designed to give extra protection from Russian anti-tank rifles (yes… rifles to shoot tanks, you read right). I’m reasonably happy with the appearance of the slightly rusted and oxidized spare tracks, but they have a visible seam line! THE HORROR! THE HORROR! 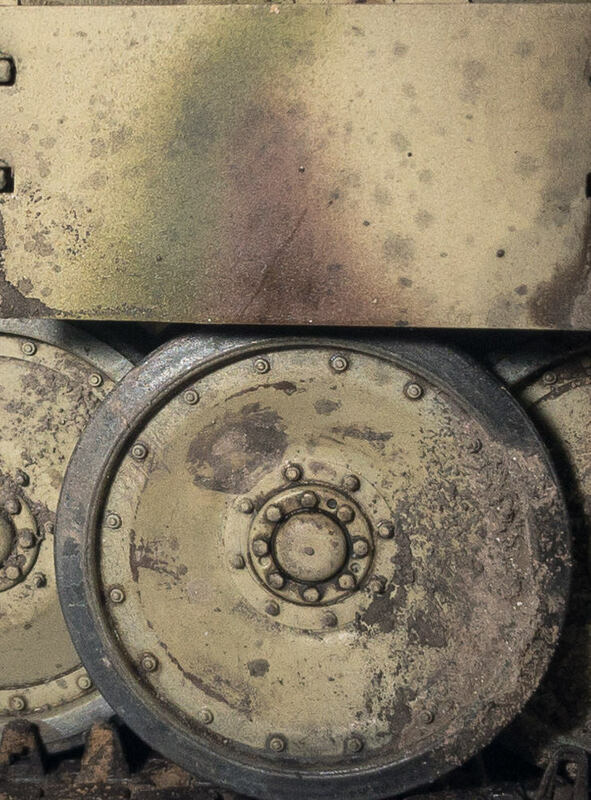 Speaking of, I LOVE the patina of the side of the turret. But I… left a seam unfilled at the base of the cupola. Sorry ladies and gents. I’m not going to fix it now, but I will hang my head in shame. The engine deck. If you are building this kit, I HIGHLY recommend you get some after market mesh screens. Shockingly Tamiya does not include any, and they really add to the appearance. What a dirty girl. 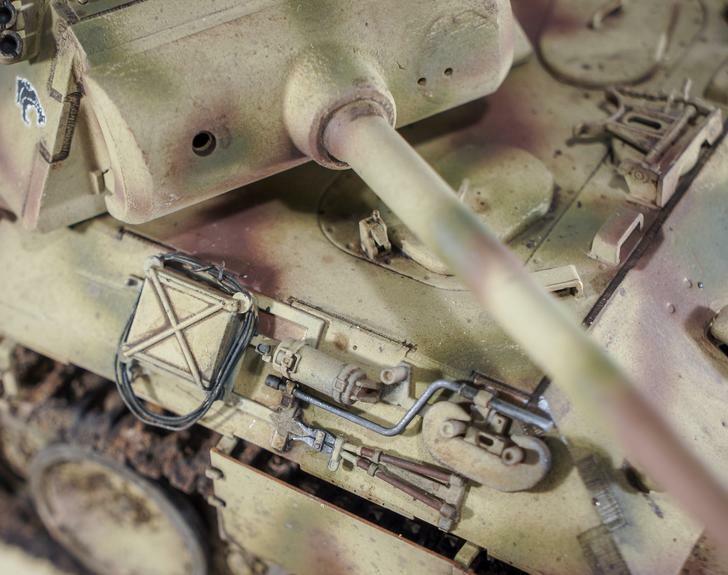 You can tell this is an early model Panther by the primitive style hull machine gun. Later versions will have a ball mount. Honestly the best part of this model is the running gear. I do like how they turned out. 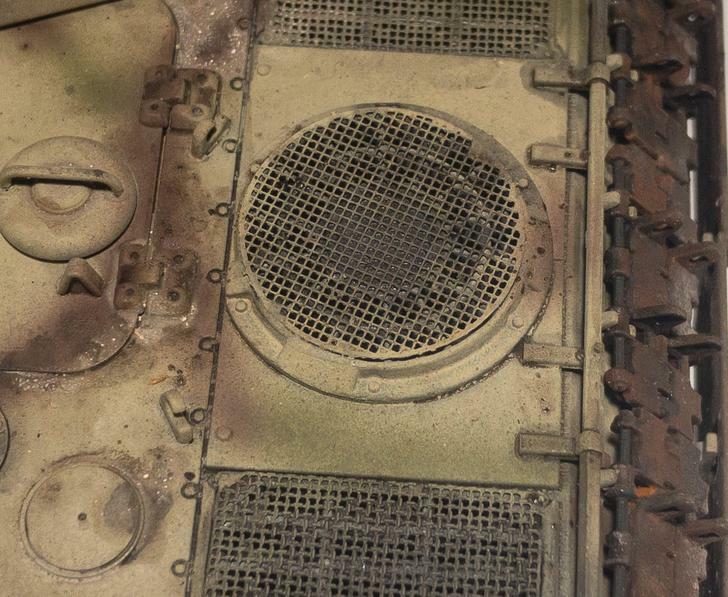 On the sides of the turret are smoke grenade launchers. If I built this again, I’d go with metal replacements… the plastic is too thick. Someone is going to need to hose this off. The inner road wheels had a typical shiny steel rim, where sand and dirt wore them down on the inside of the outer road wheels. There was a minimal separation between them. You can also see the typical hollow guide horns on the tracks in this photo. 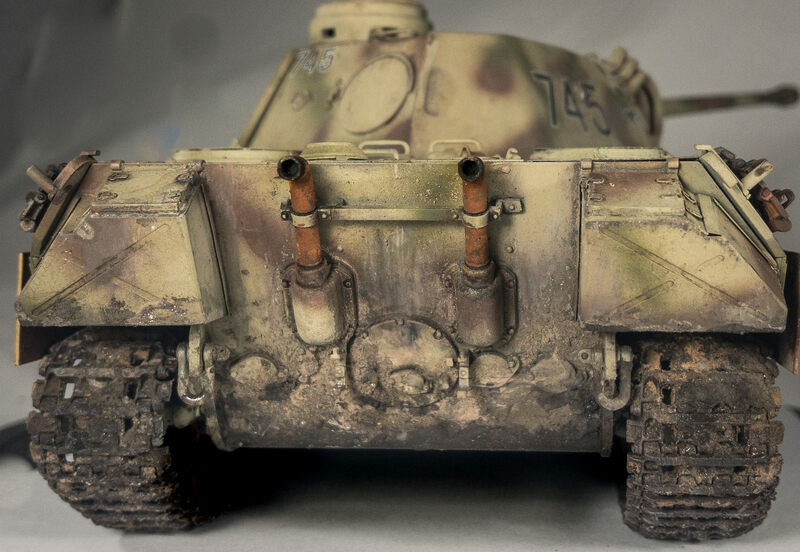 A reference photo that gave some good weathering ideas. Kursk. 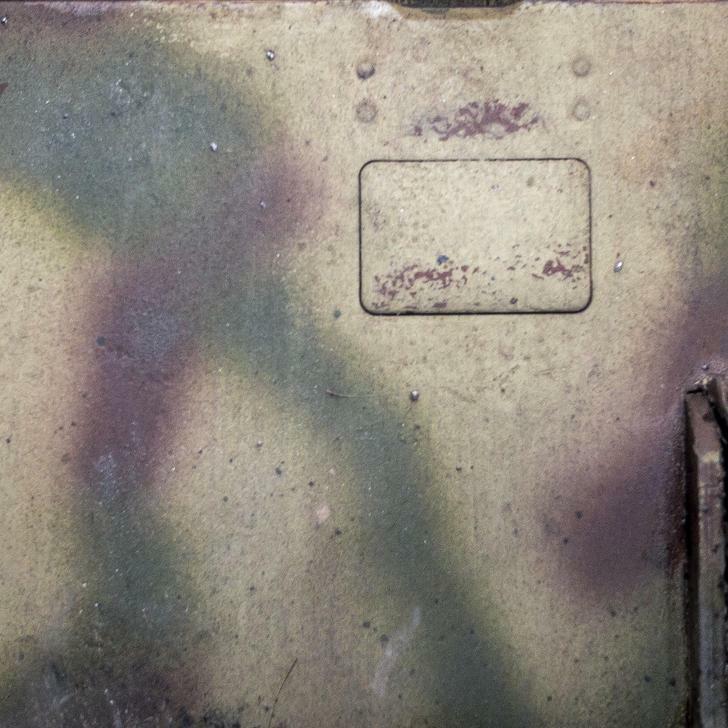 Detail shot of the back deck and spare tracks. More tools, just in case…. I like the worn appearance I managed to get on these tools, as if they have been used and roughed up a bit. You can see a faint line from the carrier film of the decal… I hate that. 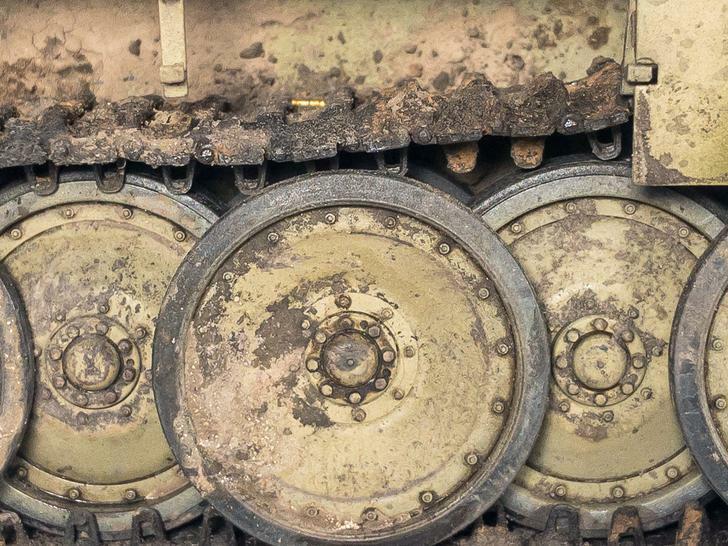 On the LEFT of the image is a large hole for the coax machine gun. On the RIGHT are a small pair of holes for the sight. Later models of the Panther would have a much improved cupola and commander’s hatch. 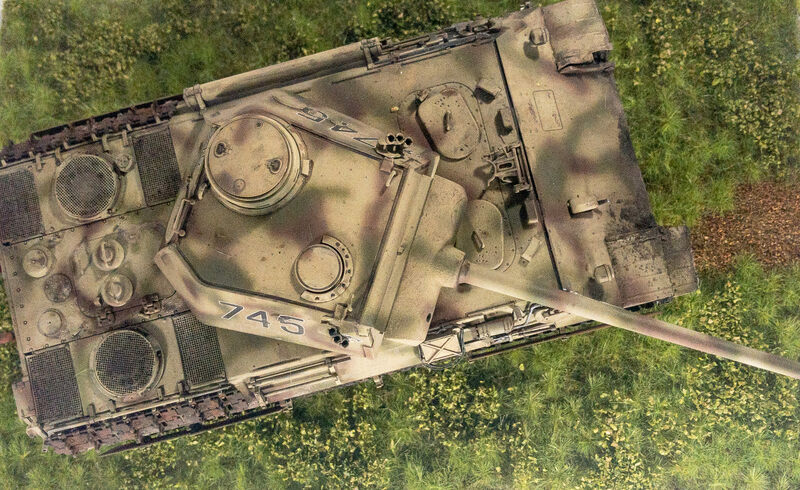 1/35 Scale Model of German Panther D Tank, Battle of Kursk 1943. 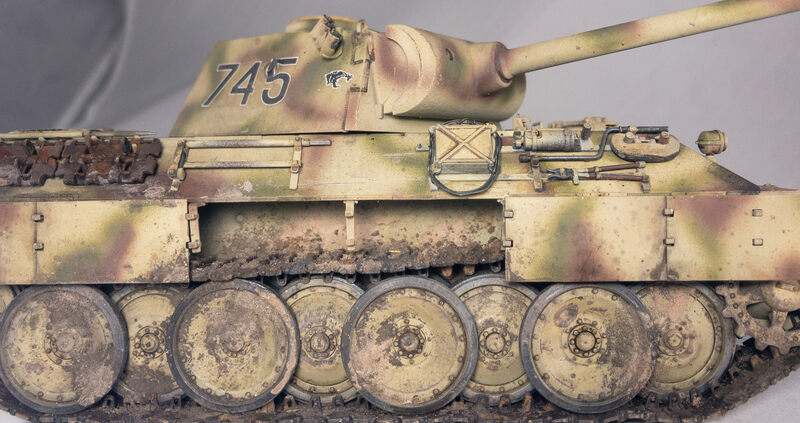 Very beautiful model – it makes the Panther look just as lethal as it really were at the time. Too bad that World of Tanks has made tanks feel so impotent and weak. That’s a beautiful job, I used to build kits back in the day. 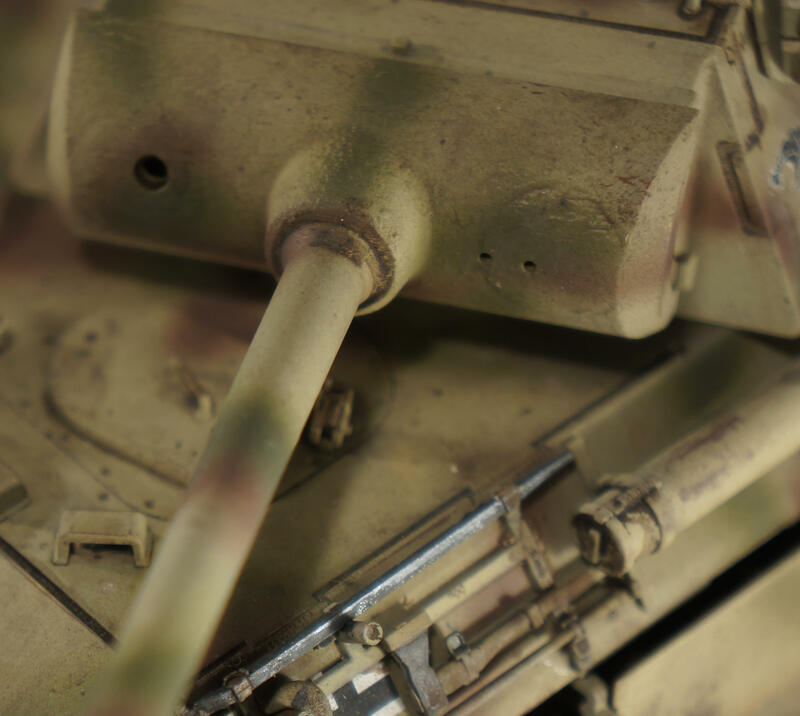 Tamiya was the gold standard.